See full line-up and more details online here. Make Music Day PDX is an event for people who love music and the joyous sense of community that music can foster. It will be held at numerous locations in Portland every June 21 (the summer solstice), with the first event taking place on June 21, 2015. 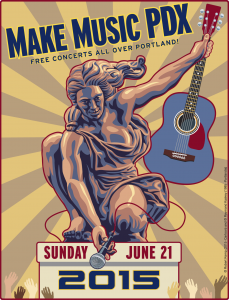 Make Music Day PDX is a call to participation: Music by the People, For the People. It is an invitation to all musicians, amateur as well as professional, to sign up to play at one of the available venues and, after practicing up for the big event, to perform on June 21. And it is an invitation to music-lovers to show up at the venues and enjoy the musical offerings. Make Music Day PDX is a celebration of music of all genres played by and enjoyed by people of all stripes. We plan to have music from Alternative to Bluegrass to Classical to Zydeco. And we hope to have a large turnout from the whole community, celebrating together our shared love of live music. We will be joining over 725 cities around the world to celebrate Make Music Day – so help us make this day unforgettable as we kick off summer with music for all to enjoy! Make Music Day PDX is an outgrowth of the Fete de la Musique, which originated in France in 1982. The event began as a call to musicians in Paris to get out in the streets on June 21 and play their music. It has since spread and has a large footprint, particularly in Europe and parts of Africa, but also in a handful of cities getting started in the U.S. We think this is a great idea that fits the Portland way of life perfectly.